Building Delta Kites - 3 Different Low-Cost Options. There aren't any detailed instructions on building Delta kites on this page. For that, you might like to try the e-book Bundle download. However, this page is worth a browse if you are thinking about knocking together a cheap Delta kite from your own ideas. You might avoid a few pitfalls! This information is just a collection of thoughts, observations and experiences from building Delta kites from my Skewer and Dowel series of designs. By the time I had got around to making and flying all the Delta designs mentioned here, I standardized on using a Template for the sail. This gets construction off to an accurate start by transferring the Template shape to one side of a plastic bag, with the bag edge being the center-line of the kite. It's easy to get the sail shape very symmetrical by using a plastic bag in this way. This means that later, the spars are fitted to the sail, rather than the other way around! The Big MBK Book Bundle up there also offers info on building a double-sized Delta from dowel and plastic. With leading edge spars 2.4m (8ft) in length, the result is a light-wind floater of pretty impressive proportions! The info is printable too, which you might find convenient. Have sails made from cheap, single-ply plastic bags. Have spars made from cheap materials. Bamboo BBQ skewers or hardwood dowels. Have a keel made from flying line and bag plastic. Involve a small amount of wood gluing. Have detailed instructions and plans available in e-books. The 1-Skewer Delta is really for small kids, or adults with limited patience :-). As far as Delta kites go, it's quite a quick build and therefore a good workshop kite for kids. With enough tail, this little kite provides plenty of fun in light to moderate winds, on 50 meters (150 feet) of line or less. The 2-Skewer Delta is a bit trickier to make due to the slightly more gluing involved. This design looks and performs well enough to engage an adult for as long as they want to watch a kite fly! It's quite capable of flying at 100s of feet in the air, and will readily respond to any thermal lift around. The Dowel Delta is a nice big 'floater', which exerts a satisfying pull on the line due to its significant wing area. 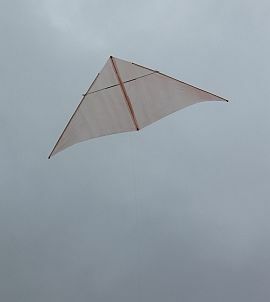 As long as it is accurately constructed, this kite easily flies at the legal ceiling which is 400 feet above ground here in Australia. Your country might be 500 feet or 150 meters. Or perhaps you are in the Third World somewhere, where there aren't any Altitude Police to spoil the fun as you fly right up to 3 or 4 thousand feet! Fore-and-aft balance is better, without needing to add any tape across the trailing edges. Save some weight! There's more wing area for almost no increase in overall weight. Hence the kite will fly in lighter winds. If the kite tends to loop around in one direction, it's possible to tweak it straight by adding a tiny amount of tail to one wing tip. Just experiment, so the extra drag on one side is just enough to correct the looping. Mind you, if the wind is just too strong, nothing will stop the little Delta from going unstable! It's easy to double the size of the 1-Skewer Delta just by making each spar from 2 skewers end-to-end. Short reinforcers need to be glued on to make the joins strong enough. This adds a little extra weight, but with 4 times the surface area of the 1-Skewer kite, that's not at all a problem. In fact, I've found building Delta kites this way gives an almost perfect combination of strength and weight. The original 2-Skewer design was a bit marginal without a tail, so a short tail was added to give enough stability for long flights. In windier conditions, adding even more tail is sometimes necessary. This results in a slightly stiffer vertical spar. Dihedral can be built right into the horizontal spar, eliminating the need for a bow-line. Of course, a floating spreader, unattached to the vertical spar, is the usual approach for Deltas. But a fixed horizontal spar works too, and just happens to really suit 2-skewer-spar construction! The 'small tail on the wing-tip' idea would probably work fine, but I found this unnecessary for building Delta kites with 2-skewer spars. Since it's twice as big as a 1-Skewer kite, it's so much easier to end up with required build accuracy. A tip: Try to match the horizontal spar skewers though. If one is much stiffer than the other, there could be problems near the top of this kite's wind range. By the way, with both skewer designs, gluing alone seemed fine to hold the bamboo together. I can't remember a single in-flight failure due to a weak glue joint. So, don't bother wasting time with binding the spars with anything. Also, my instructions and plans specify the right length of reinforcers so that the final joint won't fail. Where I'm from, Tasmanian Oak is the only type of dowel readily available in hardware stores. However, any sort of hard-wood dowel should be fine. The exact density of the wood might make small changes to the kite's characteristics. The heavier woods will result in less light-wind capability and so on. The MBK Dowel Delta has quite a lot of leading edge between the upper tip of the vertical spar and the upper tip of each leading edge spar. The trailing edge of the kite is swept forwards just a little. The end result of this arrangement is a Delta which is well-balanced from nose to tail. When allowed to sink though the air in nearly calm conditions, a Delta comes down vertically. Sort of an aerial belly-flop! With a small amount of tension in the line, you can pull down the kite's nose a touch and get it to fly around like a model plane! Dowel is not as strong as bamboo! Hence, it's quite possible to snap the spreader if the kite is flown in fresh wind. It also might be the case that the kite simply has too much area for the size of dowel you are using. In any case, I've come to the conclusion that dowel Deltas really need reinforcement over 20% or so of the horizontal spar. Right in the middle, where flight loads cause the most bending. It's easy to do this by simply placing a length of the same size dowel right next to the horizontal spar, and running some glue down the entire length of the join. When dry, flip over and glue the other side also. The standard way of trimming a Delta left or right is to trim down the diameter of one leading edge spar or the other. Reduced diameter means more flexibility, which can allow you to balance the amount of flexibility on both sides. Also ensure that the vertical spar, or spine, is as straight as possible. A slight curve one way or the other will tend to steer the kite, with the effect getting worse with increasing wind speed. Use the same, or slightly heavier plastic as used for the sail. Tape lengths of flying line along each side of the leading and trailing edges. In the case of a simple triangular keel, the towing-point lines run down the keel's leading edge. These 4 lines serve to attach the keel to the vertical spar at 2 points. The 4 lines coming out at the keel's tip can be knotted to form a handy place to connect the flying line. The towing-point lines of the keel should attach just a short way forward of the center-point of the vertical spar. If the kite climbs at all, it's not too close to the center point. At least for light-wind flying! 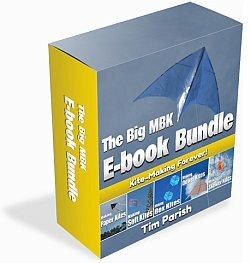 The Big MBK Book Bundle is always available if you need more specific help in making these Deltas, not to mention many other kite designs.